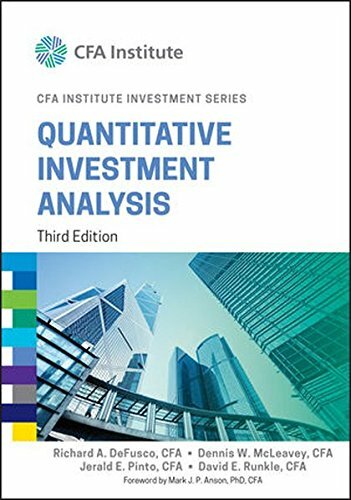 Your complete guide to quantitative analysis in the investment industry Quantitative Investment Analysis, Third Edition is a newly revised and updated text that presents you with a blend of theory and practice materials to guide you through the use of statistics within the context of finance and investment. With equal focus on theoretical concepts and their practical applications, this approachable resource offers features, such as learning outcome statements, that are targeted at helping you understand, retain, and apply the information you have learned. Throughout the text's chapters, you explore a wide range of topics, such as the time value of money, discounted cash flow applications, common probability distributions, sampling and estimation, hypothesis testing, and correlation and regression. Applying quantitative analysis to the investment process is an important task for investment pros and students. A reference that provides even subject matter treatment, consistent mathematical notation, and continuity in topic coverage will make the learning process easier—and will bolster your success. Explore the materials you need to apply quantitative analysis to finance and investment data—even if you have no previous knowledge of this subject area Access updated content that offers insight into the latest topics relevant to the field Consider a wide range of subject areas within the text, including chapters on multiple regression, issues in regression analysis, time-series analysis, and portfolio concepts Leverage supplemental materials, including the companion Workbook and Instructor's Manual, sold separately Quantitative Investment Analysis, Third Edition is a fundamental resource that covers the wide range of quantitative methods you need to know in order to apply quantitative analysis to the investment process.